Are there experts on relativity on this forum? Will we be able to talk mathematically (and all I'm talking about is the basic algebra of spacetime diagrams)? Full disclosure: I've tried 3 forums, CR4, SPCF and the physicsforums and no luck. Burt Jordaan spent years tutoring me on the CR4 and SPCF forums but he's not happy with the direction I took so he stopped. I see no point in continuing on the CR4 or SPCF forums and almost 3 yrs ago I spent a day on the physicsforums and got permanently banned for discussing a personal theory. My fault, I didn't know what I was talking about. I know so much more now but I will still irk relativists even though I use math extensively. I'm sarcastic, arrogant, relentless and, at times, disrespectful which lead to my banning recently on the SPCF forum. So what are my chances of finding another mentor here? Test question: If Alice goes out 3 light years and back at .6c relative to earth, what will be her rate of time due to time dilation, doppler shift ratio and permanent age difference just before the end of each leg of her journey from her twin Bob's perspective back on earth? If you can answer this, you know relativity. I'll even provide the answers: .8, .5, 1 for outbound and .8, 2, 2/3 for the return leg. The last number, although undisputed, is where the discussion begins. Edited by ralfcis, 03 January 2019 - 11:48 AM. Any personal answers would be an opinion. Thanks for the warning! I think I will pass on this one. I'll even provide the answers: .8, .5, 1 for outbound and .8, 2, .5 for the return leg. The last number, although undisputed, is where the discussion begins. Your Doppler numbers are wrong, .5 for outbound and 2 for inbound would be for .5c. Maybe you're just rounding. You can just ignore Doppler shift, it cancels itself out on the return journey, unless you're more interested in what the observers would actually see with their eyes than in the effects of time dilation and length contraction on their own. The last number for outbound says they're the same age? And the last number for inbound would mean that Alice has aged half as much as Bob after the journey, it should be .8. No he didn't. SR was based on the observation that the speed of light is the same in all inertial reference frames, which seemed to lead to paradoxes. SR resolves those apparent paradoxes. Ocean Breeze, you seem interesting. Just tease me a little further. Do you agree or disagree with the answers (which aren't rounded btw)? The purpose of the test question is to see who has the correct understanding of the 3 terms and that they give different answers. 1. Draw a spacetime diagram of this typical twin paradox scenario. 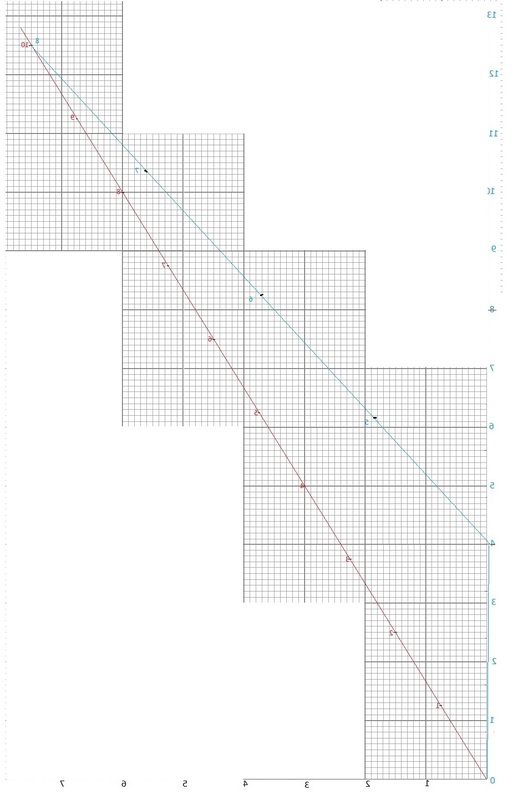 If you draw a light line from Bob's time t=1 it will intersect Alice at t'=2. This is the graphical representation of Doppler shift ratio and it shows that if both Alice and Bob were sending out a TV signal of themselves and their clock readouts, they would appear moving through time at half the normal rate from each others perspective. On the inbound leg, if Alice sent a light signal from t'=6, Bob would receive it at t=9. They are now engaged in a mutual doppler shift ratio of 2 so they look like they're moving through time at double the normal rate. I could write out the formula but the graphical method is more intuitive. I could provide the STD if you want. The question was about each leg, not the total journey. 2. Orion was correct (even though he was not addressing the question at all), they will be the same age just before the end of the outbound leg because they are engaged in constant relative velocity so the answer is 1. Age difference is not the same thing as reciprocal time dilation because it's not reciprocal once one of them initiates a change in relative velocity. On the inbound leg, Alice will age 2 years less than Bob who ages 6 years from the time they're both 4. So my answer was wrong. Alice's rate of time is 2/3 for the inbound leg not .5. Sorry I wasn't more careful. I went back to the OP to edit it and avoid future confusion The total rate of age difference is indeed .8 but that wasn't the question. How do I insert my spacetime diagram here? The age difference will be one year at the turnaround point and one more year at the finish, for a total of 2 years difference. The stay-at-home twin ages 10 years and the travelling twin ages 8 years. Your other numbers for time dilation of 0.8 (both ways) and Doppler shift of 0.5 outward and 2 inward are correct. *Is this the reason you were booted from 2 other forums? Oh good, we're talking. I tried to post an STD but can't figure out how to do it on this forum. I did say I was going back to correct my number in the OP so I'm not trying to pull a fast one. I did say the total age rate for Alice was .8 which means over both legs she aged 8 years and Bob 10. So would you agree with Orion's statement that two participants engaged in constant relative velocity age at the same rate? So just before Alice turns around, she and Bob have both aged 4 years. From Bob's perspective, using his line of simultaneity, he's aged 5 and Alice 4. From Alice's perspective, she's aged 4 and Bob 3.2. But from a 1/3 c "half speed" (my term) perspective, they've both aged 4 years. The correct answer, since they were in constant relative motion, is that they were both 4 from their own perspectives of themselves (proper time) at the turnaround point. Right after the turnaround these perspectives change except for Bob's. Alice at t'=4 sees Bob's swing from 3.2 to 6.8. But from the 1/3 c perspective, the swing in ageing rate is very small and there is zero discontinuity in actual age. Instead of Bob aging 1 yr for every year Alice ages, Bob ages 1.5 yrs for every Alice year. Now you have stated, " The age difference will be one year at the turnaround point and one more year at the finish, for a total of 2 years difference." This is what it may look like if you consider time dilation and age difference as being the same thing but there's no math proof for this being the actual way age difference unfurls. Age cannot come in wild swings or discontinuities. They would not see these sudden swings in the mutual TV pictures they receive from each other (but Alice would see the TV picture jump from half speed slow motion to double speed fast forward). I've figured out the math how age difference progresses and it's beautifully smooth. Relativity does not allow the determination of age difference until the participants re-unite except for 2 exceptions. The first is if neither makes a change in relative velocity, they are the same age and age at the same rate regardless of perspective which is only relevant to their reciprocal time dilation. Secondly, if they stop relatively to each other, a light signal between them can close the spacetime path once the signal propagates to the other. So if Alice stops instead of returns, she ages only 1 yr less than Bob but this can only be determined not at the moment she stops but at the moment Bob gets informed she has stopped when he is 8. So I'm afraid you're incorrect in your statement that age difference jumps right after the turnaround. Einstein said time is what clocks measure. Actually clocks measure age and do not measure the time component of distance separation due to relative velocity. Distance can be converted to time. The distance separation converted into time allows the equations to balance and ignore perspective. Age difference occurs at the proper time level, not at the perspective time level. Unfortunately, it's a long slog to see all the math that supports this argument. This is why I got kicked off. No one knows math, not even high school algebra, and I got very frustrated by that fact. P.S. The twin paradox illustrates the difference between age difference and reciprocal time dilation. The actual apparent paradox is in the latter because it's based on perspective. There is no paradox in age difference. I figured it out, use full editor. Edited by ralfcis, 03 January 2019 - 06:32 PM. What's your point? You said "... and he showed that the speed of light within a vacuum is the same no matter the speed at which an observer travels." That's wrong, there would have been no need for SR if it hadn't already been shown that the speed of light is constant in all inertial reference frames. The consistency of the speed of light is a postulate of SR, SR does nothing to validate that postulate other than to show that it actually does work. Why are you even bothering with Doppler shift? It has nothing to do with SR, SR is what you're left with after Doppler shift has been accounted for. That was me not Orion. they will be the same age just before the end of the outbound leg because they are engaged in constant relative velocity so the answer is 1. Yes. In the sense that until the end of the outbound journey, you simply have two inertial frames. Each sees the other as time dilated by the same amount because both frames are inertial and therefore equivalent. When Alice starts accelerating towards Bob's frame at the end of the outbound journey she will see Bob aging rapidly. If you use instant acceleration to keep it simple then Bob instantly jumps forward in time by 1.8 years so he's now aged five years to Alice's four years because it took longer for Alice to reach the end of her outbound journey from Bob's frame (the distance was less than three light years for Alice) but Alice is now seeing him as he was three years ago so she actually sees him go instantly from 2.4 months to two years. He ages slower on the return journey (but faster because of Doppler shift) and instantly goes from 8.2 years to ten years when she instantly accelerates back into Bob's frame at the end of the inbound leg so in the end he's aged ten years to her eight. I'm tired and tipsy but I think that's right. You might need a certain number of posts. When you said that, I knew you had no clue what you were talking about. Like I said, you talk so much arse! You think that SR was presented and accepted before it was known that the speed of light is unaffected by the relative velocity of the emitter? Lol! I don't want to get sidetracked from my main topic but I love physics discussions and would like to interject my unorthodox opinion on what you and A-wal are discussing. The real significance of the Michelson Morley experiment was not in proving that the speed of light was constant from all perspectives, it was that the earth could not register any velocity relative to a vacuum or more precisely the electromagnetic medium that allows light to propagate at c. Since earth can't have any relative velocity to that non-material medium, material objects can't have any relative velocity to light. Let me illustrate with a thought experiment. Fill a very long glass tube with water. Light travels at .75c through the electromagnetic medium of water. This electromagnetic medium has permittivity and permeability constants that limit the propagation of light through water at .75c. Take this tube and blast it out into space and monitor, from the earth perspective, the speed of light bouncing from one end of the tube to the other. You will see the .75c combine with the speed of the tube to give a total relative velocity result in keeping with the relativistic velocity combination law. From our perspective, the light will move at a combined rate through the tube that's less than the additive rate of the two velocities. But the tube has a leak and you will see the speed of light in the tube increase as the tube evacuates. When there's a vacuum inside the travelling tube, the speed of light within the tube will be the same as the speed of light outside the tube. The vacuum within the tube is not being moved by the tube, it is in fact stationary to the vacuum outside the tube. So you can neither register a relative velocity to a vacuum nor can you cause a vacuum to move. This is why I go ballistic when I see in textbooks STD's of the twin paradox where Alice is depicted as stationary and Bob is depicted as moving. Alice is stationary wrt what; empty space as the earth and bob have moved away from her and all space is moving past her? Empty space can't move past anything. Neither Bob nor Alice are stationary, they are both moving relative to each other which is something a spacetime diagram, in its current form, cannot depict properly. Edited by ralfcis, 03 January 2019 - 07:52 PM. You said he never said that yet you just admitted it. Guys, guys, vamonos. I got some serious work to do here. I'm not a relativity expert so am not in the market for an extended discussion, but I thought it might be worth drawing your attention to a possible weakness of your scenario, based on the areas of physics I am more familiar with. It is not true that the speed of light is slower in a material medium - or not true in a simple sense. The phase velocity is reduced, but the front velocity, which determines the transmission of information, is still c. (There is also the group velocity which may travel at yet another speed.) It seems to me that the relevant velocity for your scenario will be the one at which information is transmitted, which will remain c.
Edited by exchemist, 04 January 2019 - 02:30 AM. So would you agree with Orion's statement that two participants engaged in constant relative velocity age at the same rate? Orion didn’t say anything. All Orion does is copy and paste something with no thought of his own. He made no attempt to answer your question. Now you have stated, " The age difference will be one year at the turnaround point and one more year at the finish, for a total of 2 years difference." This is what it may look like if you consider time dilation and age difference as being the same thing but there's no math proof for this being the actual way age difference unfurls. Unfortunately, it's a long slog to see all the math that supports this argument. This is why I got kicked off. No one knows math, not even high school algebra, and I got very frustrated by that fact. You have not shown any math. All you have done is posted a lot of words and almost all of it is wrong. The math is not difficult at all. The fact that they are monitoring the Doppler shift cannot have any effect on this result. The only thing it can do is change the apparent way the twins perceive the relative ages during the trip but even then, their perceptions must agree with this final result. The relativistic Doppler shift for a spaceship that is approaching is the inverse of the shift for a ship that is receding. 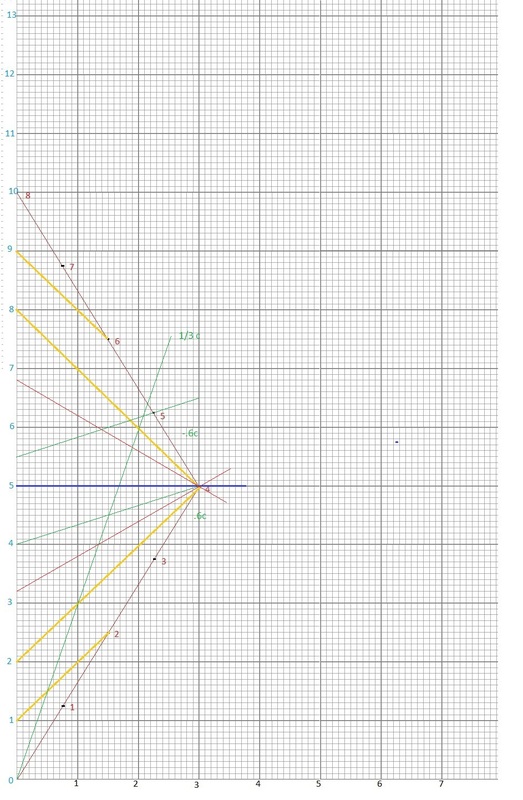 For v = 0.6c, Z = 2 approaching and 0.5 receding. The traveler ages 8 years while the earth twin ages 10 years. If you are getting something else as your answer, you are wrong and that is why you have been getting kicked off of other forums. But don’t worry, you won’t get kicked off of this one. The moderation theme here is the more crackpots the merrier! So I'm afraid you're incorrect in your statement that age difference jumps right after the turnaround. I have not said anything to indicate that the age difference "jumps" anywhere.